Rick Keys, left, U.S. Fleet Forces project officer, and Chris Harding, Poseidon study project manager, will be at Castle High School tonight to answer queries about an environmental impact statement supporting replacement of aging jets. Aircraft noise at Kaneohe Marine Base will rise by 37 percent when proposed jet-powered P-8A Poseidon anti-submarine jets replace aging P-3C Orions in 2019, the Navy estimates. But Chris Harding, project manager for the P-8A environmental impact statement, said all of the aircraft noise will be over open water and not over civilian populated areas near Mokapu Peninsula, where three squadrons of 18 patrol jets will be stationed. The base also is home to Marine helicopters. Harding is part of the team of Navy and civilian contractors who will hold an informational meeting starting at 4:30 p.m. today at Castle High School auditorium. Beginning at 7 p.m. the public will be allowed to present testimony on the environmental impact statement, which supports replacing the Navy's aging P-3C Orion subhunters at Marine Corps Base Hawaii at Kaneohe Bay, and naval air stations at Jacksonville in Florida, Whidbey Island in Washington and North Island in California. The Navy hopes to make a final decision by the end of December. It wants to replace all existing 120 Orions with 84 new Poseidons by 2019. The Navy has been flying Orions since 1964. This would result in 36 fewer aircraft and a decrease of 1,431 Navy personnel. Eventually the Navy envisions 12 fleet squadrons with 72 Poseidon aircraft and one fleet replacement squadron with 12 Poseidons. Four years ago the Navy selected Boeing to develop the Poseidon, which is a modified 737-800 commercial jetliner. Because the Poseidon is a jet, the noise on the Kaneohe Bay flight line will be "slightly different" from the P-3 Orion, which is propeller driven, Harding said. There are now 27 P-3 Orions stationed at Kaneohe Bay and assigned to Patrol Reconnaissance Wing 2. 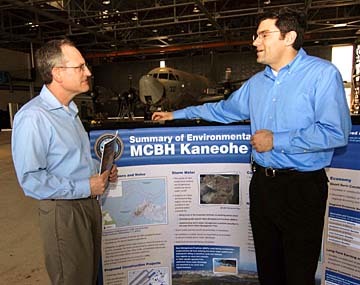 Under its preferred alternative, the Navy needs to build a new hangar at the Kaneohe Marine base to accommodate the taller and wider Poseidons. The Navy also would have to expand the aircraft parking area on the northeastern end of the existing aircraft parking apron. Rick Keys, U.S. Fleet Forces project officer, said the building housing an aircraft simulator also would have to be expanded. Although two areas near the existing flight line were identified as possible Hawaiian burial sites, Harding said the Navy has already made plans not to build anything near those and other possible culturally sensitive areas. Initially, $169 million will be pumped into Hawaii's economy because of the needed construction and renovations projects. However, because there will be fewer people and planes in a Poseidon squadron compared with a Orion squadron by the time the transition is completed, there will be a loss of 737 jobs.